This colorful and crisp pickled vegetable recipe is so easy to make and requires no complicated canning procedure. 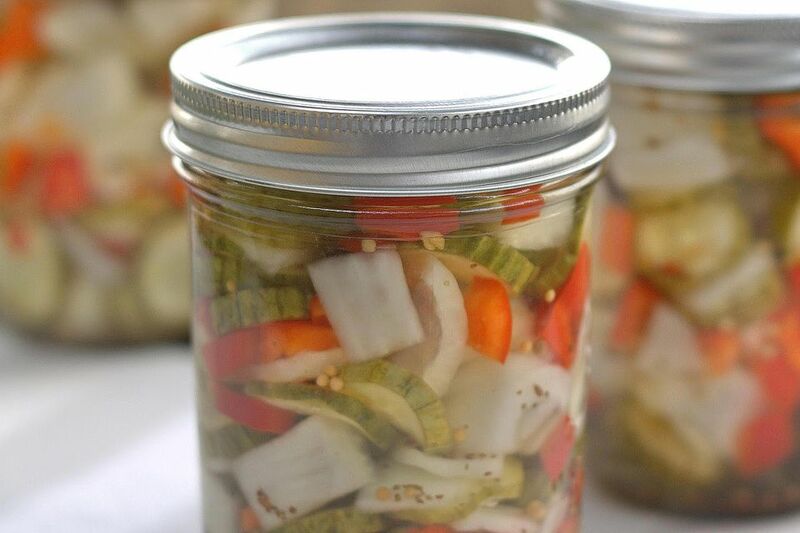 A hot sweet and sour brine is used to marinate the vegetables, and in just a couple days your quick and easy pickled vegetables are ready to enjoy! Add all the trimmed vegetables, except the garlic, into a large, stainless steel mixing bowl or stockpot (must be made from a non-reactive metal). Combine all the rest of the ingredients in a large saucepan (non-reactive), and bring to a rolling boil over med-high heat. Carefully pour the boiling liquid over the vegetables, and make sure all the ingredients are submerged in the brine by using some large plates or glass platters to hold them under the liquid. When the vegetables have cooled completely to room temperature, wrap tightly in plastic wrap (leave the plates on the container, so the vegetables remain under the pickling liquid). After refrigerating for at least 2 days, the pickled vegetables can be taken out of the liquid and served. They will keep for about 5 days submerged.